Kaboo Casino comes from a long line of highly successful casinos and is in fact the third of the online gaming platforms owned by Betit Operations operating out of the Island of Malta. Unlike the first casino owned by its parent company which opens with some soft rock music, Kaboo welcomes you with an astonishing video and a voiceover that looks like something from the heights of Hollywood. 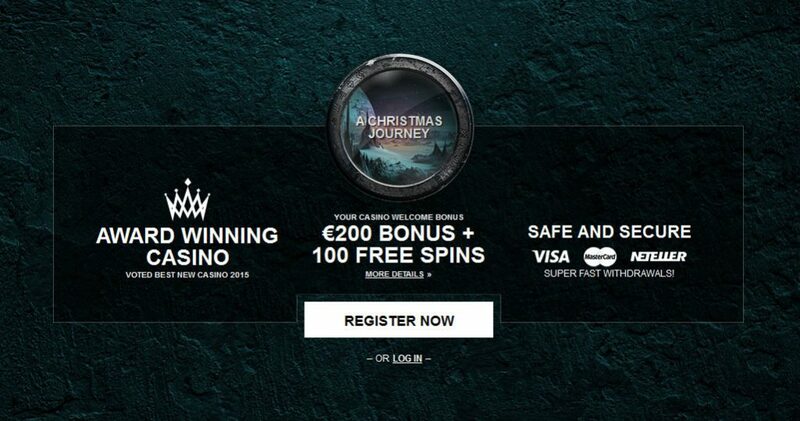 It also offers a several games that afford players with lots of free spins and other promotional offers. As a new joiner to the Kaboo Casino, you are entitled to a welcome package that includes a generous number of free spins. You will also be awarded 5 ‘echoes’ which is what the currency at Kaboo casino is called. The value of each echo is about 0.10 of the currency that you are depositing. For instance, if you are depositing in United States Dollars, then an echo for such transaction is $0.10. Once you have some echoes, you might want to use them to enjoy some very rewarding slots game but what you must know is that the smallest amount of echo which you must have to get free spins is not lesser than 10. More like what many other casinos offer, Kaboo Casino has a welcome bonus package and a second one known as reload bonus are on a hundred percent return to the 100 GBP, USD or EUR depending on the currency you are depositing. Although you can use echoes on slots, you must be aware that the value of an echo is tied to the type of slot game you want to use it for. For instance, the cheapest slot game in the Kaboo Casino is Starburst and you can get a spin of the game for just an echo. Other slot games cost considerably more. With its wagering requirements regarding deposits and bonuses, Kaboo Casino takes a spike with about 60 x playthrough rate, exactly double of the industry standard. However, the free spins that are a part of the welcome package are not affected by the strict wagering requirements so when you get your free spins, you can use them to earn as much money as you can and then request to withdraw them without anyone batting as much as an eyelid. 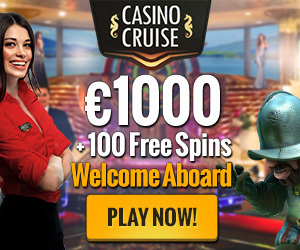 It doesn’t stop there, in fact it gets more interesting here because even after the first two bonus spins, subsequent free spins have a meager 1x playthrough rate for as many free spins you win. Wonderful, isn’t it? Another set of bonuses that comes sparsely to players is the reload bonuses but unlike the 60x playthrough that deposits have, the reload bonus has a considerably lower 35x playthrough rate. 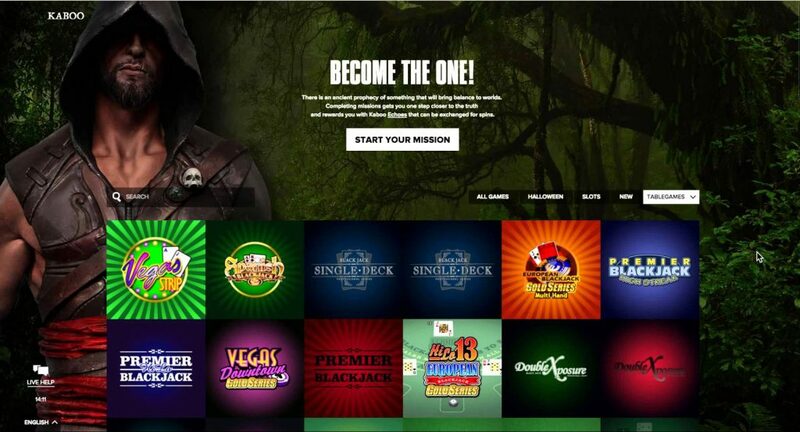 We feel before you trot of to sign up to the casino, you should know that there are some games that do not contribute to your playthrough rate and they include BingBang, The Wish Master, Tower Quest and a host of others. The good thing is that all these games are conspicuously listed on the site so you knight want to confirm which ones is literality for fun particularly if you are interested in striking out the playthrough rates on time. Additionally, games like all the slots variants contribute a staggering 100%, table games helps with as high as 40%, baccarat, blackjack, video and casino poker all contribute a miserly 5% while all the roulette variants offer nothing to your playthrough rate reduction. To get extra echoes, you might want to embark on the many missions that can be found on your account page on the website. There are often lots of missions to choose from so there is no fear of ever falling short of missions to take up. Also from your account, the amount of echo you have can be easily managed and monitored. Importantly, each time you plat a game, there are pointers that indicate whether or not the game contributes to the progress of the mission at hand. Slots lovers are usually the most whenever you check the stats of people who frequent online casinos, so it is understandable that the Kaboo Casino has lots of slots games which is slightly over 300 and keeps growing. However, for lovers of other games, the Blackjack has about 29 variants, there are 49 video poker games, Casino poker accounts for 14, Roulette varieties are 17 and the Kaboo casino has not lesser than 5 Baccarat games. Apart from the aforementioned, there are many arcade games like bingo. 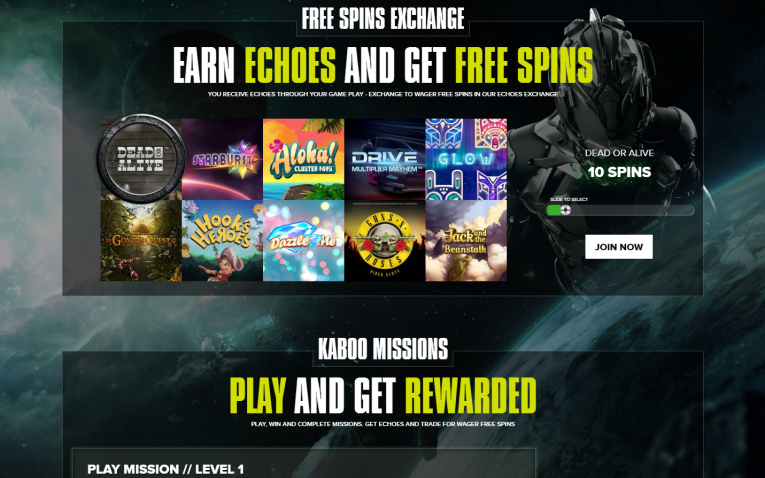 The Kaboo Casino sources its games from powerhouses like Microgaming and NetEnt with occasional droppings from developers like IGT and Quickspin amongst others. Surprisingly, there is no Live dealer available in the casino. Kaboo Casino makes up for this significant blow to his bowels by currently concluding plans to ingest games from Betsoft and WMS to their already saturated list of game vendors just to ensure that player get the best value for their money. Most of what you can enjoy on the web browser, you also can on mobile. In fact reviews from players who have accessed the casino via their tablets have been heartwarming. The casino accepts deposits via, MasterCards, Visa, Skrill and even Neteller but the lowest deposit as earlier noted remains a tenner of any currency you are depositing usually, any of dollar, pounds or euro. However, the minimum amount you can withdraw is a twenty of any of the aforementioned currency. 100% extra on your first two deposits. 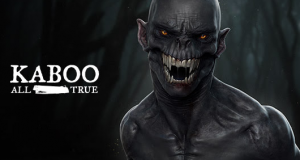 In total up to €200 bonus plus 100 echoes from Kaboo Casino.